From Judson Reid, CCE Cornell Vegetable Program. This article originally appeared in VEGEdge (Volume 12, Issue 12, July 6, 2016). Reposted with permission. Two Spotted Spider Mites (TSSM) are at high levels in many greenhouse/high tunnels across the region. The pest has risen to damaging populations in crops such as peppers, onions, tomatoes and cucumbers. Often they are in high numbers on weeds, which serve as green bridges into vegetables. When not controlled, TSSM will destroy a crop. Look for stippling, or small white dots on the surface of foliage. TSSM, their webs and eggs can be found on the underside of leaves, except when in very high numbers when they will move throughout the canopy. For many, a 10x hand-lens will aid in scouting. Two spotted spider mints on high tunnel tomato. Mites, webbing and feeding damage visible. Photo: Judson Reid, Cornell Vegetable Program. TSSM overwinters in New York State in the soil or crop debris. Controlling weeds and reducing dust (with mulch) are the first preventative steps. Biological control is possible with TSSM and releases of predators must begin very early. Phytoseiulus persimilis can be effective, but requires high relative humidity to survive, so may require repeat releases. Other beneficials to control TSSM includ Feltiella acarisuga and Amblyseius californicus. 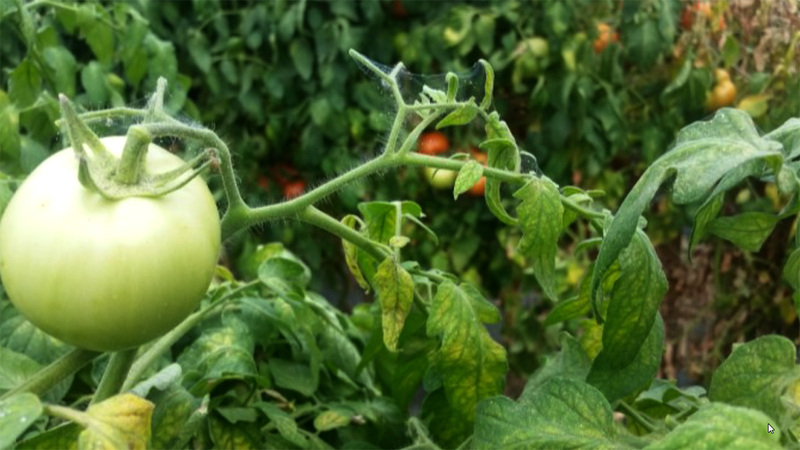 The benefits of biological control include reduced labor and no PHI/REI concerns. Biocontrol is suitable for both conventional and organic farmers. The spray options for organic control are limited to oils that encapsulate the mite when applied at high pressure to the underside of foliage. Biocontrol, when deployed early is an excellent option. Field growers beware: Dry weather favors mite infestations outside, too.